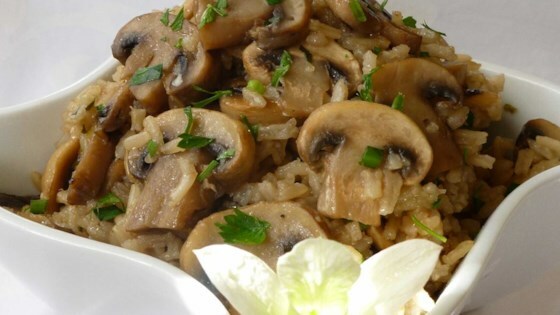 "Rice with mushrooms, garlic, onion - who could beat that? My family loves this recipe! You can also use it as a main meal if you add cooked chicken after the rice is cooked. This recipe works equally well with white or brown rice, instant or otherwise. It always comes out delicious!" Melt butter in a saucepan over medium heat. Cook mushrooms, garlic and green onion until mushrooms are cooked and liquid has evaporated. Stir in chicken broth and rice. Season with parsley, salt and pepper. Reduce heat, cover and simmer for 20 minutes. Excellent! Just pay attention to the rice/lquid ratio. 1 to 1 for minute rice or 1 to 2 for long cooking rice. This rice was really good - I served it for company and it was real easy to make and much better than plain rice. If you use long-grain rice, it is only 1 cup rice to 2 cups broth.